Whether you have a de Kooning or your child’s first painting, Artscapes/Young Framing will give your treasured masterpiece the close attention it deserves as well as the highest quality framing and design. We are acknowledged experts in the field of art preservation. 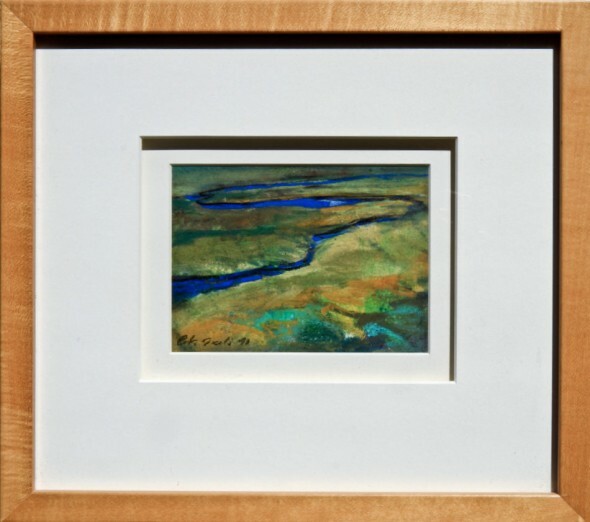 Our experienced framers are formally trained artists who excel in design and advanced decorative techniques. We are committed to ensuring that your art is presented beautifully and safely, with results you will be proud to display for decades to come. And Artscapes provides strong guarantees on both the quality and design of our work — a level of assurance we’ve not seen matched by any other framing company. We also love to prove that high standards and personalized service do not have to be expensive. Whatever your budget or the scope of your project, our goal is to exceed your expectations, and make your experience enjoyable and stress-free. Artscapes first opened its doors in 1988 as an art gallery and retail frame store in downtown Los Gatos. Word of our high quality work quickly spread, and some of the region’s most prominent collectors and curators began using our services. In 1992, we relocated to a large studio in nearby Campbell in order to focus exclusively on custom framing and art preservation. 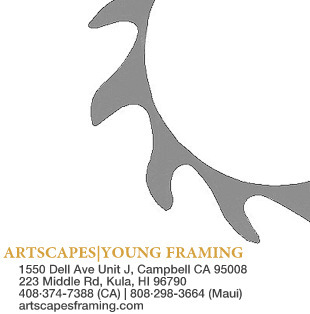 Our workshop in Maui opened in 2003, when Artscapes’ owner, Glenn Young, began living there part-time and developed a thriving relationship with local galleries and private collectors. Today, Artscapes attracts clients from throughout Northern California and Maui. Over the years they have entrusted us with a wide array of art requiring exceptionally meticulous treatment, including Old Master paintings, contemporary mixed media pieces, fragile ephemera and works on paper, rare textiles, and tribal artifacts. (View our list highlighting some of the artists whose works we have handled.) Nevertheless, some of our favorite projects have involved treasured family photographs and personal momentos. We have also been privileged to advise and carry out special projects with leading museums, private collectors, and galleries. These include Stanford University’s Cantor Center for the Arts, which secured our services to frame and preserve some of its major collections, and the de Saisset Museum at Santa Clara University, which commissioned us to design the moulding profile and frame the Edward S. Curtis Native American photography collection. The History Museums of San Jose, San Jose Textile Museum, San Jose Museum of Art, and Hui No‘eau Visual Arts Center are among the other institutions we have served. Clients using our corporate services have included Google, eBay, Apple, AMD, and many smaller businesses and retailers. 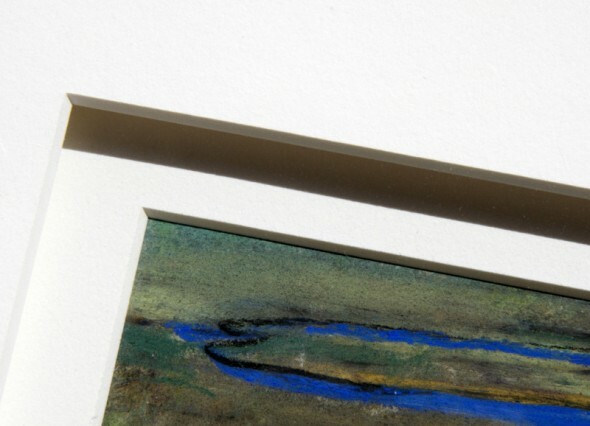 You can be assured that our framing techniques are state of the art, and adhere to the latest recommendations of leading conservators. Our sources are considered the best in the world. We mix our own mounting paste from scratch; we get our washi (Japanese mounting paper) from a papermaker who is considered a living treasure in Japan. We’re experts in handling non-traditional and challenging media. We provide comprehensive assistance for clients who face large or complex projects. And we design imaginative, innovative framing treatments that are both aesthetically pleasing and structurally sound. Our knowledgeable, friendy staff has extensive training both in framing and visual arts and will provide you with as much design guidance as you like. Learn more about the services and specialized techniques we offer. 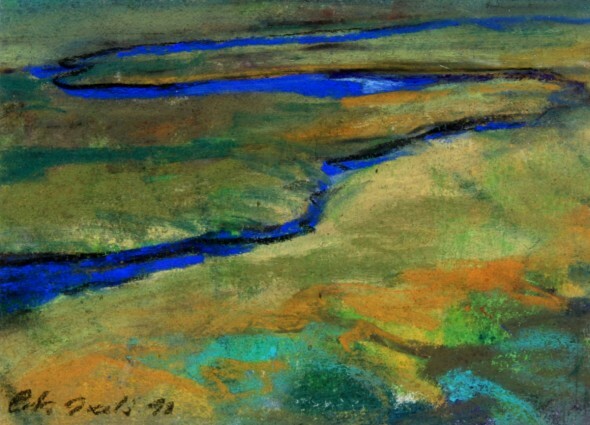 Featured artwork: River (Blue), pastel by Icelandic artist Erla Axelsdottir. Collection of Glenn Young.